With an autumn backdrop at the McGill Martlets’ home turf on McDonald campus, Concordia’s women’s rugby team secured a crucial 30-20 win on Sunday to conclude a perfect 6-0 season heading into the playoffs. “I’m ecstatic about the undefeated season,” said Stingers coach Graeme McGravie. The story of the game was the sheer dominance of Concordia’s forward pack. Led by veteran Claire Hortop, the pack took it to McGill early and often. It was the clinical execution of the rolling-maul that gained the Stingers valuable metres, time and again. The scoring started early as McGill prop Amanda Henderson barged over the line. The conversion made the score 10-3 after both teams traded early penalty kicks. For the Martlets, that was the last time they would take the lead all afternoon. 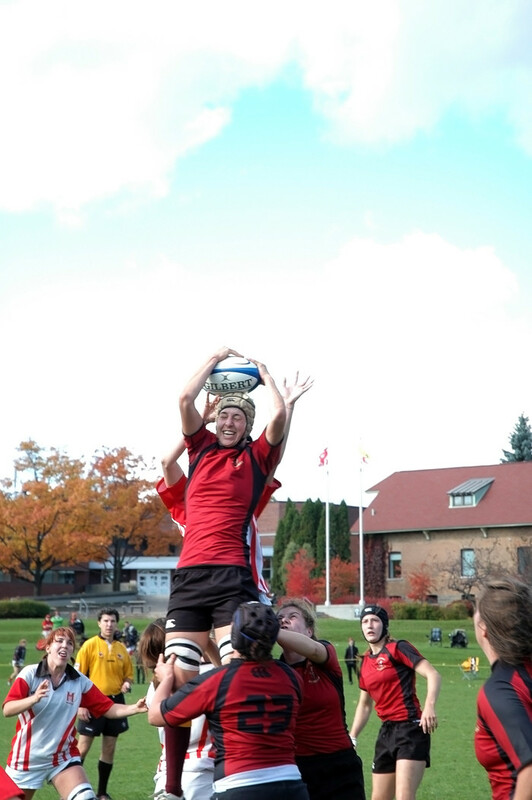 ConU came storming back up the field, churning up yards in one 20-metre maul that placed the Stingers on McGill’s doorstep. After repeated attempts were held up, ConU’s pack drove back its opponents’ scrum to net the Stingers’ momentum building push-over try. The usually rock solid Jackie Tittley struggled early with her kicks, and missed the conversion wide to keep the score in McGill’s favour. McGill’s talented back-line kept the Martlets close with some key tackles made by fly-half Stephanie Lynam. However, the Stingers kept their cool under pressure and were able to kick for territory whenever they found themselves in trouble. The pack again marched the ball down field and barged across the try-line to take the lead, 12-10 as Tittley, who was still looking to find her range, missed the convert. A slicing run by Concordia fly-half Erika Hamilton saw her break the Martlet line, but the kick went unconverted and left the Stingers ahead 17-10 going into halftime. The Stingers’ pack picked up right from where it left off, scoring another demoralizing push-over try early in the second half following a yellow card to McGill’s Cristyn Edwards for unsportsmanlike play. Tittley, who managed to settle herself, hit a beautiful strike from out wide to extend Concordia’s lead to 22-10. McGill’s back-line, led by some dizzying runs from fullback Briana Miller, managed to punch in a score to close the gap to 22-15. If there was a weakness in the game for Concordia, it was the team’s inability to shut down Miller and the Martlet counterattack. A late try by Stingers’ number 8 Cara Stuckey kept McGill from ever seriously challenging the outcome. However, coach McGravie said he wasn’t pleased when Miller turned something out of nothing and cut through ConU’s back-line for a 50-metre highlight-reel try. The final score was 30-20, but the numbers don’t tell the whole story, according to McGill coach John Lavorie. “[Losing by] 10 points might have been a little flattering for us,” he said. The Stingers can look forward to playing a quarter-final match on their home turf, although they need to wait for the result of a midweek game between the University of Ottawa and McGill to find out who their opponent will be in next Sunday’s playoff game. This article originally appeared in The Link Volume 31, Issue 10, published October 19, 2010.